Despite the rising use of tankless water heaters, several common misconceptions prevent people from making the switch from conventional storage tank-type units. Switching from a conventional storage tank-type water heater to a tankless model is a difficult decision for most American consumers. For some, it’s the up-front cost. Others may understandably hesitate to make the switch because they have relied on tank water heaters all their lives. However, tankless water heaters offer several advantages that can help users save space and energy. To show how beneficial tankless heaters can be, let’s eliminate four common myths to help you make an informed, confident decision to go tankless. Myth 1: Tankless water heaters heat water to an unsafe temperature. While the temperature of the water generated in a tankless heater is hot, it does not get overheated. This information is more accurate about traditional heaters, as they can overheat when there was an influx of cold water. Tankless water heaters will heat water only to a temperature slightly above a desired temperature. Tankless water heaters also include a thermostat that allows you to control the set-point temperature of the water. Noritz tankless water heaters do have a certain temperature range they use for water heating. The EZ Series heaters can heat water from 100 – 140°F. Presetting maximum and minimum temperatures will keep the heater from overheating beyond the designated range. The Noritz Connect app also allows you to have control over thermostat, simplifying the matter even more. Myth 2: Tankless water heaters require annual inspections. Another common misconception is that you must spend additional money to have your tankless water heater formally inspected yearly. Tankless owners need not worry about an annual inspection; however, it’s still a good idea to have the unit periodically checked to ensure all components are operating properly. It is highly recommended to do an annual descaling of the heater so your tankless heater can maintain its efficiency. On certain Noritz tankless water heaters, error codes will appear when there is any issue with the system. Thanks to the Noritz Connect app, service contractors can receive alerts from a WiFi-enabled water heater, giving them the problem and location. This will help tankless water heater owners identify and resolve any issues quickly with competent professional help. Myth 3: Tankless water heaters will not supply constant hot water. This myth stems from the fact that tankless water heaters do not store hot water. Many people are led to believe that because of this lack of storage, it will take time for the water to get to the desired temperature. This can be the case with a tank heater. It stores a certain amount of hot water but will then need to reheat new water, something that can take 30 or more minutes. As long as there is a demand for hot water, a tankless water heater will supply a continuous stream of water at the preset temperature. If the tankless unit has not been sized properly for a given application, the flow rate of the water may drop, but the output water temperature will remain will remain within range of the preset level. In a Noritz tankless water heater, the water is heated by an Eco-Burner that modulates the amount of fuel consumed to meet current demand. This allows the heater to supply hot water only when needed, allowing it to meet the household’s needs, while minimizing the amount of energy used. 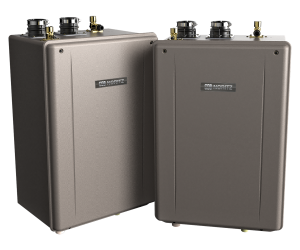 Many people believe that tankless water heaters are more expensive to operate than a storage tank unit. In truth, they are less expensive. Tankless heaters have a lower energy cost, but have a longer service life. Depending on the energy factor (EF), a tankless heater can save minimally 20 percent on your energy bill. Also, because a tankless water heater does not store hot water, you are not paying additional money to keep water heated all the time. Additionally, local gas companies can offer rebates for utilizing tankless technology, allowing you to save more money by using a tankless water heater. The EZ Series water heaters have an energy factor of .96, allowing it to cut the cost of an energy bill by 27-50%. This is higher than many tankless heaters that only have an energy factor of 80%. Tankless water heaters are an environmentally friendly solution that can be used in both commercial and residential buildings. Tankless heaters also require less space, allowing them to be easily accessible when needed. Make sure you know all the information about this technology in order to facilitate a switch to tankless water heaters.